Illinois State University President Larry Dietz has named Jan Murphy as the permanent vice president for Academic Affairs and provost, effective March 1. Murphy has served as interim provost since January 2017. A national search was conducted to fill the vice presidential position. During that process, changes in the dynamic of the candidate pool, along with feedback from campus constituents and shared governance bodies, led to the decision to name Murphy as permanent vice president and provost. Murphy’s career spans over 30 years at the department, college, and university levels. She joined Illinois State in 1986 as an assistant professor of family and consumer sciences, becoming a full professor in 1995. She served as the University’s associate provost for more than 10 years and has previously served as interim provost (2008). 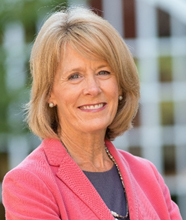 Her roles in the College of Applied Science and Technology include former assistant dean, associate dean, and chair of the Department of Family and Consumer Sciences. She has also served as director of Campus Dining Services. Murphy received her bachelor’s degree in nutrition and dietetics, a master’s degree in human nutrition, and a Ph.D. in nutrition research from the University of Nebraska-Lincoln. She has numerous publications and funded research grants in several areas of nutrition research. She has served as a peer reviewer for the Higher Learning Commission (HLC) since 2004, currently serving on the HLC Institutional Actions Council. Murphy has won numerous awards for outstanding teaching, research, and service including, most recently, the Phyllis Memken Outstanding Teacher Award and the University Distinguished Service Award.